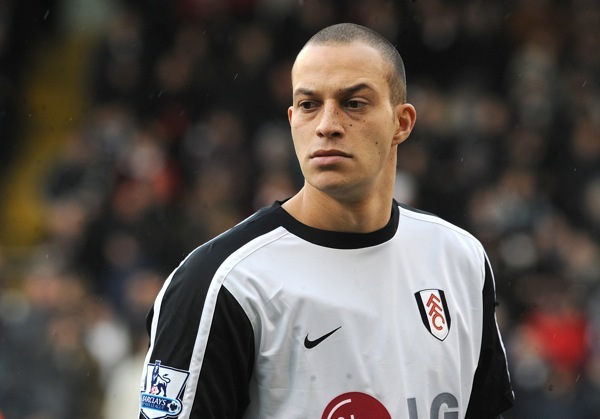 Pub Debate: Is Bobby Zamora Good Enough For England? Lots of calls of late for Bobby Zamora to make it onto Fabio Capello’s longlist for the 2010 World Cup, from the likes of club manager Roy Hodgson, team-mate Zoltan Gera and skull-faced love machine Teddy Sheringham (football’s own Ronnie Wood). It’s true that Row Z is having his best ever season in the top flight, and he’s scored a couple of out-of-character crackers recently, but in my opinion he’s NOT England material. It’s not that I don’t think he’s a very strong striker who is capable of unsettling most defenders. It’s not that I don’t like him as a player – believe me, I’d LOVE to see him score the winning goal in the World Cup final and then ‘Shhhh’ Sepp Blatter and Michel Platini. It’s simply that his playing style is not well-suited to international football – put him in an England shirt and he wouldn’t get away with half of the physical stuff he does in the Prem. That’s a problem, and other big front men such as Peter Crouch have experienced it before on the international stage. Even Alan Shearer had to tone down his natural elbows-and-all game for the Three Lions. Of course, I could be way wrong; Zamora might thrive for England. He might even be the next Toto Schillachi. A Rooney/Zamora partnership appears balanced too, so it would be worth trying it out in one of England’s World Cup warm-up games. But I suspect that Capello’s pecking order has Emile Heskey, Crouch and Carlton Cole way ahead of Zamora. Would you take a gamble on Bobby, or do you think he lacks the quality required to play top-level international football? Very good, well reasoned argument. I am a Fulham season ticket holder and so have seen him for a couple of seasons now. The first game I ever saw him (Bolton at home I think) he scored a great goal and I said he could be England material. He is strong, fast, good in the air, has great touch and has a very good understanding of link up play. But then the goals stopped. He started to lose confidence and with this the rest of his play dropped. But this year with A.J. getting injured he has seriously had to step up to the plate and has actually started scoring. With a few goals came back his confidence and he has actually blossomed into that player he looked like he could be early in the first season with us. He is terrifying for defenders and for that reason I would definately try him on an international level. I would suggest that a Rooney Zamo partnership up top would be a phenomonal thing that would provide so much pace and strnght it could be almost unplayable. It would help rooney too as Zamo works like a horse and looks for his partner all the time. Only problem is, as you say, the refereeing internationaly. And I really think this could be a major stumbling block. Although if you don’t try it you won’t know. He is certainly a better player at the moment than Bent, Heskey, Crouch or Carlton Cole. I can’t agree with this I’m afraid. Zamora’s an agile target man who isn’t overly physical. He doesn’t wrestle defenders to the ground and has a deceptive burst of speed that often gets him into dangerous positions when you least expect it. What you’ve not mentioned is Bobby’s ability. The chest passes, vision, distribution and lovely little flicks would give someone like Wayne Rooney plenty to feed off. Personally, I think he offers more than someone like Crouch and I’m yet to be convinced about Carlton Cole at international level. Then there’s his scoring record. His failure to score goals was brought up every time you mentioned Zamora’s name but he’s been banging them in left, right and centre. He’s almost one in two for this season (15 in 32) and has scored in his last four games. He’s in the form of his life and deserves a shot. If Capello’s picking people on form, Bobby’s got to be in him. Most importantly of all, England never win the World Cup without a Fulham player – so he’s got to go to South Africa. Dan, I can’t argue with your last point! He is very physical though, imo. And I’d say he’s mentally too up and down. I could see him freezing for England. Dan, he is physical though. Don’t let your love of him cloud your vision. He’s got so many great abilities but he is ‘a handful’. If that was taken away from he’d be much less of a player, just accept it. He might get away with it, mainly cos he normally isn’t doing anything wrong, but possibly he wont. So the only way to tell is to give him a go. As a West Ham fan I’ve seen the best and worst of Zamora and much as I love him can’t see him being anything but a flop for England. As you mention, his mental fragility is well known, even one of the Fulham fans that has commented cites this. This has plagued him throughout his career, and whilst Zamora full of confidence is a brilliant striker, when he’s down he is pretty shocking. Too big a risk for Capello I think. Perhaps if he kept up his form he’s worth a punt for the European Championship campaign though? Tom: Funnily enough, I’m not actually a great ‘Bobby lover’. I was one of those who wondered in the summer whether we could get a better finisher in when he looked like he was off to Hull. My point regarding Bobby’s physicality was that he’s hardly Nat Lofthouse or your archetypal hulk of a English centre forward. He’s a lot more subtle than the lower league battering ram. One half-decent season suddenly makes him England class? This is Bobby freakin’ Zamora we’re talking about!! Can’t say the lad should be on the england squad. we got rooney conreted up there then crouch, defoe, owen and other big names to throw around. There’s a difference between suddenly making a couple goals and playing world class. I hope he gets the chance to show what he can do against Egypt in the upcoming friendly. On the basis of Bob’s form, I think it is worth starting him with Rooney for the first half to see how he gets on. I think the only way you can say whether he is England material or not, is by seeing him play for England. He may not be one of the BIG name strikers and he may not of always had the form but you cannot argue that he is the ‘in form’ english number 9 at the moment. I can see Capello definately taking Rooney, Defoe and Crouch. Whether he takes Gabby, Cole or Bob is something to certainly ponder. In the domestic games I’ve seen Zamora’s had to be physical as he’s always got a defender (or 2) hanging off him and I can’t see that going down too well with international referees. He’s strong, he’s a big physical presence and I think he’d complement Rooney superbly. I don’t think his temperament has much bearing: look at Rooney in the last World Cup. Zamora’s older, I know, but that doesn’t mean he can’t still mature as a player. My concern is the confidence aspect that has been mooted above – if he’s not confident then he won’t play as well as we all know he can, and it’ll take time to build up that confidence in an England shirt. Whether Capello has the patience I don’t know so it may be a bit of a vicious circle of Bobby getting only occasional games, not performing to the best of his ability, Capello not being that impressed, Capello not playing him for a couple of games. I’d love to see him play against Egypt next week (although slightly concerned about our FA Cup game 3 days later if he does…). He deserves a shot though. Anyone who says otherwise needs to watch videos of our last few games more closely. I think Bobby is a great goalscorer when he’s on form, but my biggest issue with him is his inability to find the right pass when counter attacking. By that I mean when with the ball at his feet as he often gives it when he can’t chest it off or give it away straight away. Saying that I don’t think its a fair point about international refereeing as he has scored goals in Europe this year including a brace against Basel which we needed to qualify and we all know that the refs in europe are harsher than in the premier league. Btw I’m a Fulham season ticket holder too.